The beach-blessed coastal villages of Burghead and Hopeman are situated on the shores of the Moray Firth in the north east of Scotland. Burghead is an attractive and thriving holiday resort located on a peninsula that projects into the Moray Firth and is surrounded by sea water from three sides! The headland tip of the town is still packed with the scant remains of early fortifications, including two earth ramparts just off Bath Street, upon which an eerie burnt-out pillar sits. This is where the Clavie - a burning tar barrel is still carried around the town on January 10th to mark the old calendar’s new year - The Burning of the Clavie! The Burning of the Clavie is held on 11 January each year, except when the 11th is a Sunday, in which case it takes place on the 10th. The harbour has a wide sweep sandy beach which stretches 5 miles around Burghead Bay to Findhorn and offers wonderful views back over the town and along the coast. 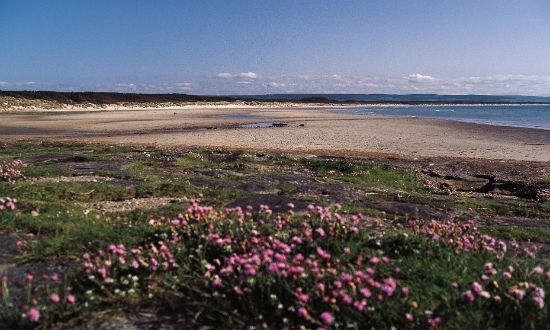 Nearby the beautiful fishing village of Hopeman has two attractive sandy beaches, and offers visitors such attractions as preserved dinosaur footprints, a druid site and the Bramou Well (said to have healing properties). The town also hosts a Gala week every July.